I read through my own article written exactly a year ago and I was able to realise the positive energy around me these days. Indeed, Retail is back in action and retailers are glooming. Employees of various Retail Companies are busy, scouting new locations, charting exciting Marketing Plans and working towards the best Customer Service possible. After all, consumers are happier too. The first instance where consumers stop spending during a slowdown as well as splurge their excess funds is in Retail and it was quite clear this year. Large Retailers have reported between 15-40% increase in Sales year on year. While the main challenge in 2009 for Retailers was to bring consumers to the Retail stores, it was increasing the wallet-share that was the key focus area in 2010. I should say that most Retailers have been successful in this regard, which is clearly visible basis the current mood in the economy. The year started off a bit dull, until the union Budgets were announced. Housing Interests once again fell down drastically, pushing the economy at a higher pace. 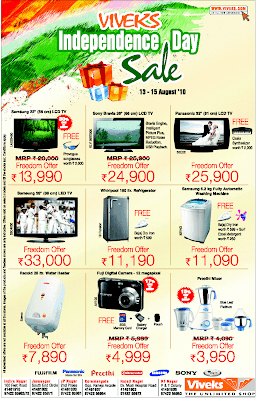 Automobile manufacturers passed on additional discounts and freebies encouraging consumers to buy now, buy more! Apparel Retailers witnessed higher throughputs, largely because the shopping cycles had reduced in the previous four seasons. F&B and Restaurant players witnessed the “bill values” go higher since people were spending more these days than earlier. 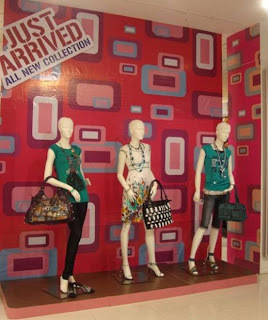 Large international players such as Spanish Fashion Brand Zara and UK based toys retailer Hamley’s who had earlier shown interest in the Indian market, entered with large stores in Delhi and Mumbai and are expanding across other cities. French haute couture house Nina Ricci and shoemaker Christian Louboutin and Italian fashion label Max Mara are also eyeing India, according to Boston Consulting. Marc Ecko will launch the brand in the coming spring in a partnership with RPG Group’s retail flagship Spencer’s Retail Ltd, which plans to have in place at least five international alliances next year. Yesterday (on 30th Dec. 2010), Carrefour, the world’s second largest Retailer from France opened its door for shoppers at the most unlikely location at Shahadhara, in East Delhi. 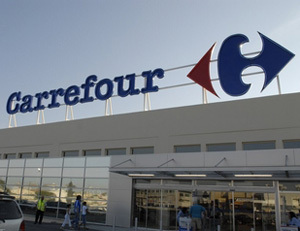 "The opening of this first store marks Carrefour's entry into the Indian market and will be followed shortly by the opening of other cash-and-carry stores," Carrefour CEO Lars Olofsson said in a statement. Bharti-Walmart opened a handful of Cash & Carry stores this year at Zirakhpur, Kota, Ludhiana and Bhopal, with a dozen more lined up for the next three years. Meanwhile, Indian Retailers have been keeping pace with the speed at which shoppers have been marching. India’s largest Retailer, The Future Group has opened several large format retail locations including Central Malls, Home Town, Pantaloon Fashion stores and most importantly, the company’s flagship Big Bazaar. 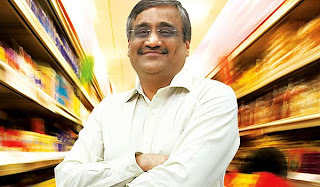 At the India Retail Forum held in Mumbai in September, organized by Images multimedia, the father of Indian Retail Industry Kishore Biyani responded to a question and said “The biggest lesson learnt is we cannot be everything to everyone and have hence aligned our way forward accordingly”. 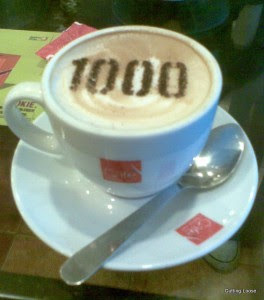 Cafe Coffee Day, India’s largest cafe chain crossed an important milestone in its journey – the 1,000th cafe and the numbers are growing month after month. Shoppers Stop, Hypercity and Crossword, all part of the K Raheja Group are expanding in a frenetic pace to reach out to the upwardly mobile whose incomes have rose 10-50% since the past year. Spar Hypermarkets and Lifestyle Department Stores are also expanding in their own right. Every Retailer in the country is on expansion mode and the overall optimism seems to be surging high. Airport Retail took a different dimension since the commencement of Terminal Three or T3 at Delhi. The largest airport in India at the moment, the Retail spread is something that’s indeed worthy a case study by itself in times to come. PVR and INOX are determined to entertain more cinema-goers this year with more screens & multiplexes. 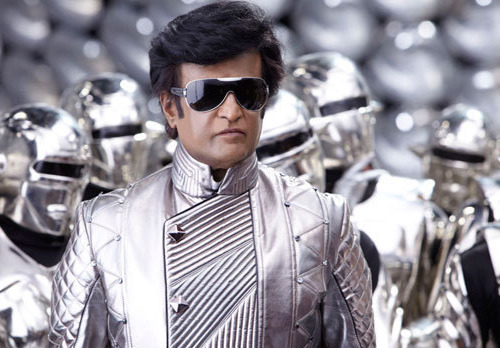 Chitti, the Robot created by its scientist Dr. Vaseegaran (both characters portrayed by the Superstar of Indian Cinema Rajnikanth) in the tamil film Enthiran (Robot in Hindi) that is directed by Shankar wears Ray Ban, Police and other designer sun glasses all through. There is a particular scene where the two of them shop diamond necklaces for their common girlfriend at Joy Alukkas, a leading name in ornamental jewellery in the southern markets in India. And the villainy Robot drives a Bentley, ransacks a Lifestyle Department Store only to stock up everything that’s needed for its lover. The scientist and his robot travel in a Mercedes CLK while the scientist’s home is shown as an exquisitely designed villa. All through the film, the leading characters including Aishwarya Rai wear designer stuff, exclusively crafted by ace designer Manish Malhotra who shot to fame since the late 90’s when he designed outfits for the likes of Shah Rukh Khan and his contemporaries of the Hindi film industry. This is Manish’s second outing in the South after the previous hugely successful Sivaji (2007) which had the super-hit combo of Rajnikanth & Shankar. 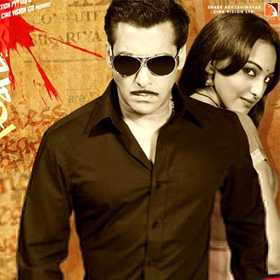 Meanwhile, Salman Khan’s recent Dabangg portrayed him as a Police officer whose moustache and Ray Ban became more popular at some stage than the plot of the movie itself. So, what’s with film actors and Brands? What is the underlining message? Well, there are two, in my opinion. One, that the film shows the characters as having been “evolved” using the latest – be it gadgets or cars, clothes or accessories. Second, “brand placement” or “product placement” is seen as a great opportunity by many brands (including retailers) to create aspirational value. While the trend has been popular in English and European movies for many decades (James Bond and his love for cars and gadgets, for example), the trend has been on and off in Indian movies. I remember another Tamil movie “Tenali” (2001) which featured Kamal Hassan as a “hyper” patient who is scared of almost everything in life, portraying Toyota Qualis as a very reliable car when it hits the edge of a mountain wall and nothing happens to its occupants. Shah Rukh Khan in the movie “Don” (2006) sported Tag Heuer watches which became hugely popular among the relevant target groups. Most recently, Sonam Kapoor in the film Aisha (2010) sported trendy bags and sun glasses while also shopping at Delhi’s DLF Emporio, the most upmarket Mall that houses Dior, CK, etc. But the big question is do these product placements have any impact on “consumers”? Yes and No. While there is certainly an impact on the consumers about the awareness of the brands and products, the aspiration to own them is limited, given the fact that most of these brands appeal to the top-end of the society. As much as a Rajnikanth or Salman fan who pays over Rs. 300 for a movie ticket during the first week of release would love to own one of those sun glasses, he just can’t afford it. And it applies to clothes, accessories, and even cars. So, do these placements atleast bring walk-ins into the Retail stores? Ace designer Deepika Govind feels not necessarily as those who wear designer stuff may not want to wear something that’s very common. “Such clients follow global fashion and hence do not pick up something off the shelf worn by actors and actresses that are available off the shelf”, she says. It could be a bit different for street wear as promoted by the likes of Hrithik Roshan or Ranbir Kapoor but the following is limited and appeals mostly to the urban audience. Budding designer Aarti Tibrewal opines that the characters portrayed by films stars have indeed impacted what the audience what to wear. “At the same time, the commercial success of the movie has much to do with the brand recall,” she says. For example, the Anarkali dresses worn in them movie “Devdas” (2002) were popular also because the movie was a box-office hit, while Aisha didn’t fare as well as it was expected to be and hence the follow-up was also mute. 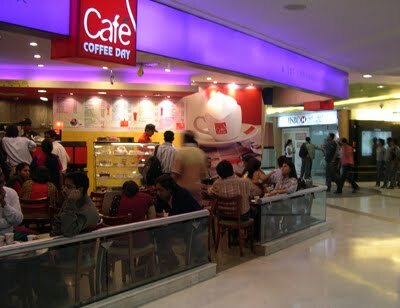 Retailers like Cafe Coffee Day and many other restaurants and bars allow a lot of movie shootings at their outlets so the audience are able to connect easily with their favourite hang-outs. While some charge the producers for letting their “space on hire” a few exchange it for the publicity they would derive. Brands, on the other hand use this primarily as a promotional tool, taking their product range to a wider audience. While the topic of “success on product placements” can be debated a lot, immediate results vouch for its success. A quick check at the eyewear counters of Department Stores in Mumbai and Chennai / Bangalore confirmed that there were a number of enquiries for sunglasses after shoppers saw Dabangg & Enthiran respectively. May not be the same for the Mercedes and Bentley though. Anyway, I am planning to increase my Ray-Ban collection, so what about you? A Retailer cannot be everything for everyone! “I was an eternal optimist, now I am a cautious optimist” thus remarked Kishore Biyani, considered to be the most revered Retail face in India at the concluding day of India Retail Forum 2010 recently held at Mumbai. Not surprising, as he should know better than anyone else, for he leads the Indian Retail Industry with the highest recorded turnover of over USD 2 Billion in Sales from The Future Group that has various formats such as Big Bazaar (Hypermarkets), Central Malls, Home Town, Pantaloon Department stores, Food Bazaar (Supermarkets) and many other formats with over 800 stores across the country. Many other CEOs and leaders from within the Indian Retail Industry echoed the same feeling – things are much better than 2008 / 2009 but we should tread with caution. Consumer confidence is on the high, but that doesn’t mean we can open stores left & right, one needs to move ahead with all the learning over the past 24 months according to the Head of Operations of one of the leading apparel brands in India. India Retail Forum (IRF) is the annual extravaganza organized by the Images Group that publishes various magazines such as Images Retail, Images Fashion, F, and many other collaborative efforts with leading international publications. 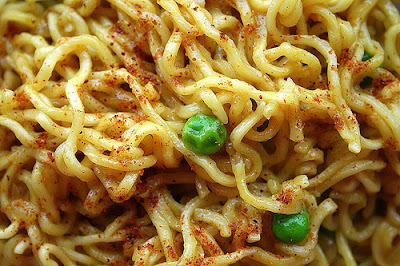 Apart from IRF, they also conduct Images Fashion Forum and Images Food Forum every year. These Forums are not mere conferences but a place of congregation where some of the brightest minds participate, share and learn over each other’s experiences. The two day events are busy days, with back-to-back & parallel panel discussions and presentations from eminent speakers and delegates trying to network with their peers across businesses for professional as well as personal purposes. This year saw over 2,000 participants – not bad for an event that charges an entry fee of Rs. 25,000 per person which includes lunch and dinner with cocktails on both days along with an entry invitation to the Images Retail Awards – the most sought after respectable awards that recognize the efforts of Retailers. The agenda this year too was chock-a-block. Over the years, the event has evolved and now follows international conventions where three things happen in parallel – the main conference hall with its speakers, the retail theatre and the ball rooms with their sessions and workshops and the all day exhibition stalls where various retailers and real estate companies showcase their latest offering. The Forum was chaired this year by Mr. Biju Kurien, Chief Execuitive – Lifestyle, Reliance Retail along with the Chairman of the previous year, Mr. B.S.Nagesh, Vice Chairman of Shoppers Stop Ltd. In his opening remarks, Mr. Kurien said that India is expected to contribute 7.5% of world GDP (PPP) and stressed on the need for increased investments within the sector to foster growth. Mr. Nagesh reiterated that it was important to focus on the product offering rather than showering discounts while also informing that controlling attrition would be one of the key tasks for Retailers. Mr. Vikram Bakshi, CEO – Mc Donalds India (North & East) shared his thoughts on the current trends in food retail during his opening remarks. This was followed by a detailed presentation by Ms. Ireena Vittal, Principal, McKinsey India in which she shared statistics about the current trends and opportunities in Indian Retail with lots of comparison to similar markets such as Brazil and China. This was followed by the Confederation of Indian Industry (CII) panel discussion on “Permitting FDI in Indian multi-brand Retail” led by its Chairman, Mr. Thomas Verghese, Chief Executive – Aditya Birla Retail which had the most looked up names within the industry – Mr. Kishore Biyani, CEO – The Future Group, Mr. Raj Jain, President – Walmart India & MD & CEO, Bharti Walmart, S. Sivakumar, Chief Executive – ITC Rural Retail, Ireena Vittal, Vikram Bakshi and BS Nagesh. With various thoughts being expressed by speakers, the unanimous view was clear and forthcoming – India needed investments urgently to support the backend and frontend of our Retail businesses and the color of the money (Read FDI or FII or any other) really didn’t matter. The rest of the day and the second day had various sessions by leaders within the Retail industry and community and delegates were seen sharing an easy camaraderie with one another, be it over coffee or beer. I was part of one of the Panel Discussions on Multi channel Retailing, hosted by vCustomer which has been a support partner to companies across multiple retail channels. With a 4000+ global workforce deployed at its managed centers from multiple locations worldwide, they deliver 24x7 services to more than 75 global clients including 20 Fortune 500 brands and more than 30 retailers. My co-panellists were Mr. Sanjay Gupta, COO – vCustomer, Mr. Ashish Madhav, Director Retail CoE, vCustomer, Mr. Rajiv Prakash, CEO – Future Ecommerce, Mr. Manoj Chandra, VP Marketing - Bata India, Mr. Sundeep Malhotra, CEO – HomeShop18 and Mr. Neeraj Bhalla, Director – Whirlpool. The speakers shared their perspectives on multi-channel use for better reach towards their own consumers. My view was similar too, that Cafe Coffee Day was always at the reach of its consumers be it shopping high streets or malls, transit points or other non-traditional locations such as Hospitals, Colleges, Hotels and Clubs. The most awaited session happened to be an interview with Mr. Kishore Biyani by none other than Mr. Shivnath Thukral, Group President, Corporate Branding & Strategic Initiatives – Essar Group, more famous in his previous avatar as the former Group Business Editor at NDTV, India’s leading News channel. The session was indeed candid and Mr. Biyani was at his transparent best, sharing some of the very rarely heard stuff – that the group has made a few mistakes, learned from them and hence moved on, that he shops only at his own group stores and doesn’t shop at fellow retailers such as Shoppers Stop. He also admitted that the group doesn’t anymore continue its approach on being “everything to everyone”. We are no more so, he said while answering a question specifically and advised fellow retailers to think about it. This was followed by an interesting session led by Mr. Vikram Bakshi and Mr. BS Nagesh where selected delegates had an opportunity to grill eminent Retail executives including Mr. Kishore Biyani, Mr. Thomas Verghese, Mr. Ajit Joshi, CEO – Croma Retail and Ms. Vibha Rishi Paul of the Future Group. At the end of the session, each winner won an hour over lunch or dinner or drink with Mr. Biyani, Mr. Nagesh and Mr. Kurien to be mentored about the business. 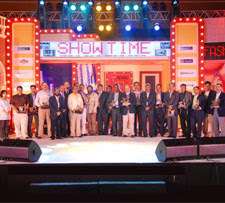 The Grand finale was the Images Retail Awards – a much looked up event in the business of Indian Retail. The award ceremony, besides honouring the most deserving companies and people in the Retail Industry, had scintillating performances by singer Leslie Lewis and stand-up comedian Ash Chandler. The event was anchored by Mandira Bedi and Anish Trivedi. The IMAGES Retail Awards 2010 followed strict international benchmarks in deciding the top honours, with IRIS Retail Intelligences Knowledge Partner and global consulting firm AT Kearney as the Process Approver. The selection process involved self-nominations as well as a countrywide poll to short-list nominees. Over 11,000 consumers and about 1,000 professionals voted for their most admired retailers across formats and categories. The list of categories, awardees and nominees are as below. Overall, the India Retail Forum 2010 came to an end with optimism coupled with caution among participants while hoping for a better times to come. Here's wishing all of us a great festive season ahead. It was a Sunday afternoon and a lazy one at it. And that’s just when someone at home asks for a pack of NAN 3 – a health substitute from Nestle SA that’s given to children. Given that it is a product not available so easily and usually procured from Pharmacies or Drug Stores, no one at home is willing to hit the road and that’s when the friendly Kirana comes to remembrance. One phone call and it would be delivered in a few minutes, suggested one of the members at the household. The next minute, someone was making the call and the friendly voice at the other end was actually prodding for further purchases if the family needed something else. A few other items were included and it was promised the stuff would be delivered shortly. And indeed, it was. In the next 15 minutes, there was a young boy at the door with a bag full of items for well over Rs. 500/-. This can happen, most probably only in India. We as a nation are not yet fully used to shopping in a cycle – although we see major crowds at the large hyper and super markets, consumers miss out buying many things – either they are out of stock or they are out of their shopping list. This is very unlike in the West where there has been an evolution of shopping habits, usually during the beginning of the month, or even on weekends, well in advance for the week ahead. But here, most times we prefer the “just-in-time” way. While the debate and discussion regarding opening up FDI in Retail has prevailed for long, there is little doubt that Organized Retailers could offer such services. “Free Home Delivery” is usually advertised at many Supermarkets like Foodworld, Spencers, Nilgiris and even a few Hypermarkets like Total, Food Bazaar but they all come with riders – that the distance should be within a 3-5 km radius, the total bill value should be above a certain level and that the delivery could take between 2- 6 hours depending on the day of the week and place of delivery. Naturally, since the cost of operating is far higher for Organized Retailers than the neighbourhood kiranas. The big boys need to maintain books of accounts, a mini truck or a van to deliver and a driver to drive (not to forget the maintenance of these vehicles) and many other internal processes. All these are negated with the local kirana. Depending on the level or urgency, the kirana is willing to deliver at the earliest and usually within the locality and most of them operate in one. Cash & Carry Retailers (are they actually retailers?!?) such as Metro AG have been operating in India since 2001 and most recently Wal-Mart in a JV with the Bharti Group has been operating such stores in Punjab under the trade name “Best Price”. These stores usually sell their wares to the smaller kiranas, hotels, restaurants, etc. who in turn retail to end users and consumers. 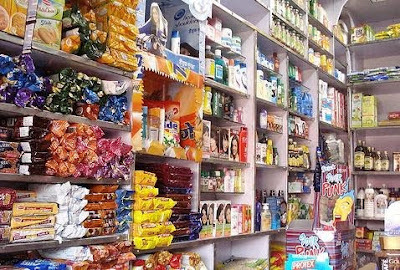 Since the large Organized Retailers order their goods directly from the brands and suppliers, they are able to pass on higher margins to the kiranas who in fact benefit from this exercise. This has been a strong point supporting FDI in Retail all along since many in the industry believe that it would do well in the long run for the Retailers, the Kiranas and the Consumers. It is quite natural to see more deliveries over the weekends, festivals days and specials events such as Cricket Series and Public holidays as there are more people to consume at home. Not just the kirana stuff, even door-delivery of food and other beverages seems to be on the rise. Last Sunday along with the morning newspapers, there were pamphlets from atleast three restaurants in the area – all small time local operators. An A4 page size pamphlet cluttered with a whopping menu of more than 100 items printed in two colours on the back and front size. But who cares! As long as the food is tasty and delivered on time, nobody bothers. What’s important is not just quick service but the quality of products. Kiranas and small-time eateries take greater care while packing, transporting and delivering as these simple steps are their real “Brand Ambassadors”. If all three were good the first time, chances are they would be called again. So, no matter how many large Retail formats open up in this country, one reason why Kiranas will remain in business is “convenience” – a fact that most of us live by. Long Live Kiranas! 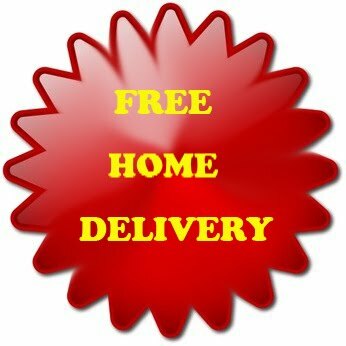 Long Live Home Deliveries! Looking at the eagerness of a family to see how a Compact Disc works was amazing – this was in the year 2001 at the Musicworld store at Park Street in Kolkata. The middle-class Bengali family was a regular at the then largest MW Store in India, spread all of 8,000 sft and among the first Retail Stores in India to be designed in bright yellow and blue by Fitch PLC. After all, RPG Management had wanted none other than among the best in the world to design their first and the largest music store in the city. Over to the family – they were wondering how a small CD with a diameter of 10 cm could play music with such clarity while the erstwhile vinyl records that used to be played on the gramophones were thicker, heavier and the voice clarity not as clear as this one. I remember chatting with my colleagues about this insight – that it is as much the responsibility of Retailers to create newer categories to grow the pie and what I was referring in this case was that the market needed more CD players, affordable and better quality, so more consumers could buy them and in times to come, would buy or should I say invest on CDs. Who would know that 10 years later not only my words would come true (in terms of cheaper options of CD players) but we would also have alternate forms of listening to music – internet, mobile phones, mp3 players, iPods and most recently I read Apple is planning to launch Watches! Successful Retailers worldwide have created newer categories and introduced them to their core customers – usually first timers within the spectrum who could spread the good word around. Central Malls, a division of The Future Group that operates over a dozen malls in India has been the pioneer in seamless retailing in the country since their launch of Bangalore Central in 2004 (of which I was lucky to be an integral part of) is doing exactly the same. One of their recent campaigns is the “Kurti Festival”. 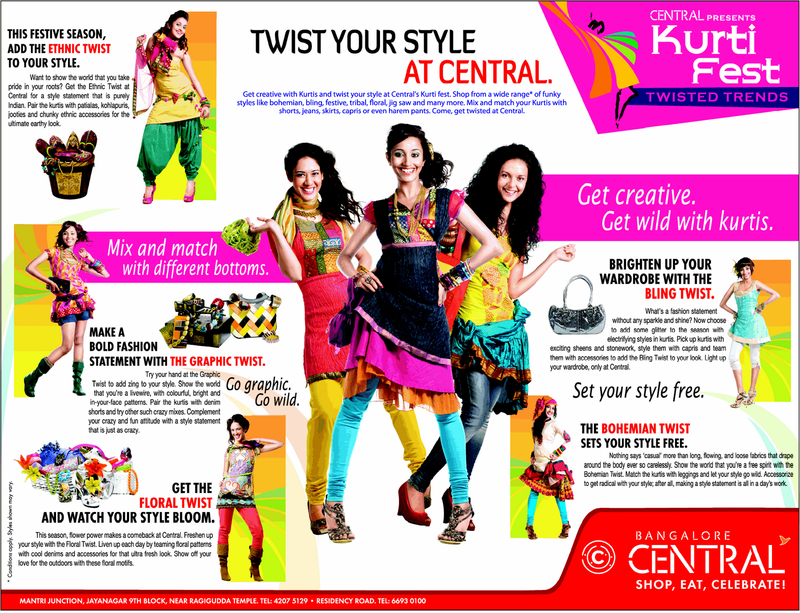 Keeping the most popular trend, Central has launched a festival that focuses on the theme – Kurtis. As part of this festival, Central will have a mix and match section where customers could experience interesting pairing which would be displayed at the Malls. Kurti is a form of apparel – a mix of western-styled Indian-design tops mainly focussed on women. The basic difference between a Kurti and a Salwar or Churidhar is that the length in the former is shorter and the core audience are the teens and tweens (those in their twenties). While the Kurtis have been made popular thanks to our beautiful heroines in Bollywood and other Indian languages, the more popular ambassadors are the customers themselves. It’s quite common to see the college goers wearing such clothing as it is comfortable for their daily routine – travelling by public transport, self-drive in two-wheelers, attending many other chores during the day such as college sessions and mall-hopping, etc. A versatile garment, kurtis are an essential part of every woman’s wardrobe and they can create the latest fashion statement with funky styles like bohemian, bling, graphic, festive, floral, tribal, jig saw & many more. Women shoppers can create these styles by mixing and matching with different bottoms like leggings, capris, denims, shorts, short skirts and harem pants. 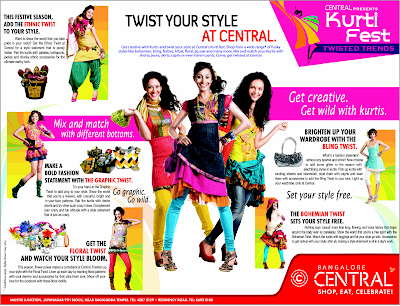 Customers can twist their style at Central’s Kurti festival for a brand new fashion statement. This is expected to attract more footfalls into their Malls and while the incremental conversions are high single-digit, the time spent by the clientele and their word-of mouth is as important. Many a time, these festivals indeed pull in additional footfalls and benefit other retailers within the Mall such as Cafe Coffee Day, McDonalds, Food Courts, etc. While many retailers keep experimenting with such ideas, very few succeed in pulling them off well and needless to say, Central Malls is one of them indeed. So, visit the near Central close to your and enjoy the surprises! There used to be a time during the late 80s and even early 90s when this part of Bangalore was the most preferred area to settle down for the older generation, mainly due to the lush greenery and minimal traffic. 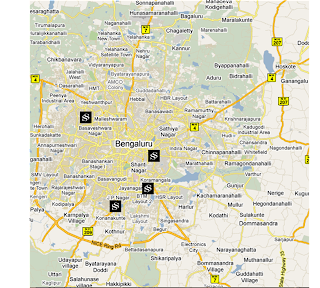 After all, why would any one pass through Koramangla – an erstwhile nondescript part of south Bangalore that connects the city towards Hosur, Chennai. Etc. However, all this changed, thanks to the IT revolution and what followed was concrete invasion. Large tracts of empty lands gave way to huge constructions – corporate offices, residential block and of course, Retail stores. In India, one thing is peculiar, if not common. It’s always the unorganized retailers who enter a locality sensing consumption opportunities. The Kirana stores that sell everything from tooth paste to grocery, the Hardware stores that sell all that one would need in their homes, from door handles to curtain rods and the ubiquitous furniture stores – large shell shops that stock cots and mattresses, dining tables and other loose furniture. After a few months, if not a few years of the area settling down with people, the Organized Retailers start swamping the localities. What’s natural is that when a locality is on the verge of getting popular (from a consumption perspective), most of the big players enter together, if not in shorter bursts, thus unsettling the small kiranas. And the same happened to Koramangla as well. 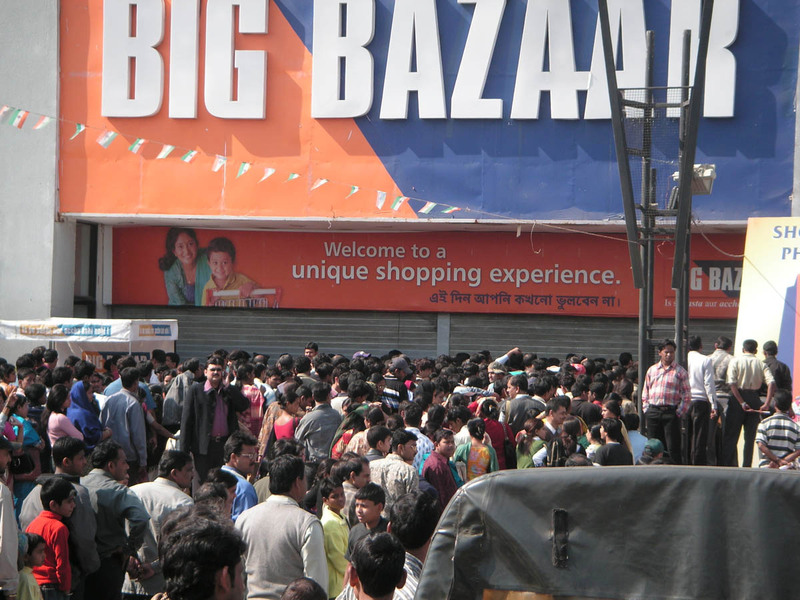 After a lull for many years, organized players started penetrating this area – RPG Foodworld (now Spencer’s), Monday to Sunday (from Jubilant Retail), Viveks – the Electronics store, MegaMart (from the house of Arvind) and most notably, Big Bazaar (BB), a Future Group concept. Interestingly, this was one of the earliest outlets for the now ubiquitous value-retailer in India, a mere 35,000 sft store that was supposed to be a Pantaloon Fashion Store! There was a last minute change in the concept and thus was born BB. The store is located in a building that also houses many corporate offices and hence parking for 2/4 wheelers weren’t too many. Anyway, value-retail stores were expected to bring their shoppers by Bus and thankfully, there was a Bus-stand just outside the store. Rest as they say, is history. This BB store attracts as many people driving their own fancy 4 wheelers as much as those coming by buses and autos and is supposedly the highest in terms of returns per sft, a key metric for Retailers. The year 2004 saw the opening up of Forum Mall, the most notable Retail landmark in Bangalore till date and rightly so, located adjacent to Prestige Acropolis, a residential dwelling that houses the crème de la crème of Bangalore. The Mall has such a unprecedented opening that the U-turn on this road had to be removed, thankfully! The first outlet for McDonalds in South India opened here and without exaggeration, there were queues waiting outside the store just to get in and have a grub. I was among the last to enjoy the frenzy, when I first entered the store almost three months after they opened. The Mall had many other firsts as well, the largest stores for Fashion Brands such as Benetton and Tommy Hillfiger, the first Apple store through its distributor aptly named “Imagine”, the largest (then) foodcourt in town with over a dozen different cuisines, and the first and among the largest cinemas in Bangalore operated by PVR. The retail chain from the house of Tatas, Westside was the anchor and Landmark Books & Leisure (which was also bought out by Tatas) was another anchor. There wasn’t a multi-brand Department store and thus all the Mono Brands present in the mall perform very well. There wasn’t anything that wasn’t amiss and the Mall ably run by a professional team from the Prestige Group went to win accolades for their achievements, in design, tenant mix, zoning and most importantly managing the multi-level car parking, among the largest & the first in the city. 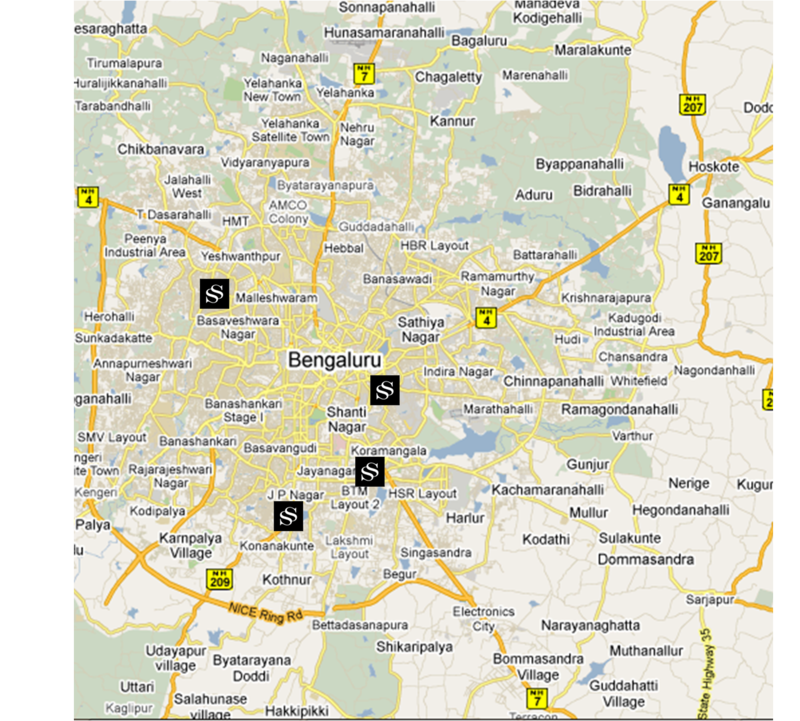 The area started getting a lot of attention from construction companies as this was the closest locality for those who were working in Bangalore’s own Silicon Valley area – The Electronics City. Real estate prices of land holding soared so high that the area was and still among the most premium residential areas in the city. Almost every Retailer has a presence in this area and the only brand to have multiple locations due to its business model is Cafe Coffee Day – yes, there are five cafes within a three km radius and there are two more in the offing. Recent retail concepts such as E-Zone (also from the Future Group) and Star Bazaar (a hyper-store from Tatas) have found their own spaces and are serving their customers quite well. The one Retail concept that was conspicuously missing was Shoppers Stop (SS), India’s largest multi-brand Department Store chain. And that too was fulfilled recently. While operating three other locations in the city and one at the Bangalore International Airport, the retailer took over the same location earlier occupied by fellow retailer and similar business house “Globus”. There were many reasons why Globus wasn’t doing well; many experts felt it was the location that was the main one at fault apart from the depressing merchandising at the store level. In Retail, there are three main factors to consider before opening a store – Location, Location and Location. And that’s exactly what SS has tried to revisit. They have chosen one of the most complicated locations ever possible for a Retailer but I am sure the decision was conscious and would prove to work to their advantage. After all, who knows this business as well as they do. 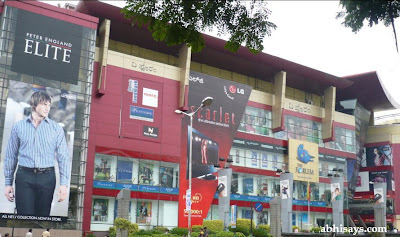 The store is located in one of the busiest stretches in Bangalore, just ahead of an important traffic signal where the waiting time could range from 10-30 minutes during peak hours to crawl through a 300 meter stretch. Entering and Exiting the store is not just difficult but would need sharp driving skills. The store, which is spread across 40,000 sft is self-sufficient to that catchment since most of the brands have their own stores independently or within the mall close by. The well-maintained and well-merchandised store has almost everything that a harried customer needs, but for a cafe which I guess should soon be there too. But why one more Retail concept for a locality that already has a substantial penetration of retail formats? Well, one reason is that there is no Shoppers Stop! The unique shopping experience that the Retailer provides is not just consistent across the country but also amongst the most superior in its own form. Secondly, when an area has as many shopping formats, it becomes a natural destination for shoppers. It’s not just the Retailers who benefit due to the presence of a large number of consumers but also the shoppers – they benefit from the wider offering that they are offered and not to mention the innumerous promotions and special offers through the year. 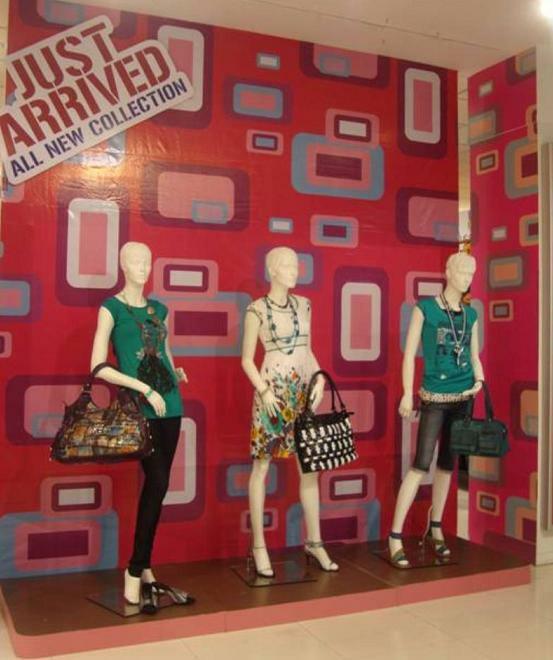 So, lets hope this outlet of Shoppers Stop is indeed going to become a show-stopper! It is quite common to see radically minded political parties create ruckus during cultural celebrations such as Valentine’s Day, Friendship Day, etc. citing them as western concepts which India can do without. Although most of them forget that ours is a Democracy and one is free to live the way they want to, provided they fall within the legal purview of our constitution. Retailers had initially taken advantage of such events, creating a lot of hype around and managing to attract customers. While the trend still continues, many of them have toned down the way it is celebrated and have started focussing on other days of national importance. In Western countries where Organized Retail has evolved much, Mother’s Day, Father’s Day and even Thanksgiving are celebrated with glee and harmony. In India, while we have been celebrating Children’s Day (birthday of former and first Prime Minister, Jawaharlal Nehru), Teacher’s Day (birthday of freedom fighter and academician, Dr. S. Radhakrishnan) and regional festivals like Akshaya Trithiya (most auspicious day to buy gold), Raksha Bandhan (sibling’s day) and Karva Chouth (prayers for the husband) for many decades now, Independence Day and Republic Day are celebrated since 1947 and 1951 respectively, ever after achieving Independence from the British Rule and since becoming a republic country. Although earlier, these days were usually celebrated with national fervour and devotion, they have been converted into social events which also include personal and family celebrations, since they are usually preceded or succeeded by a weekend. 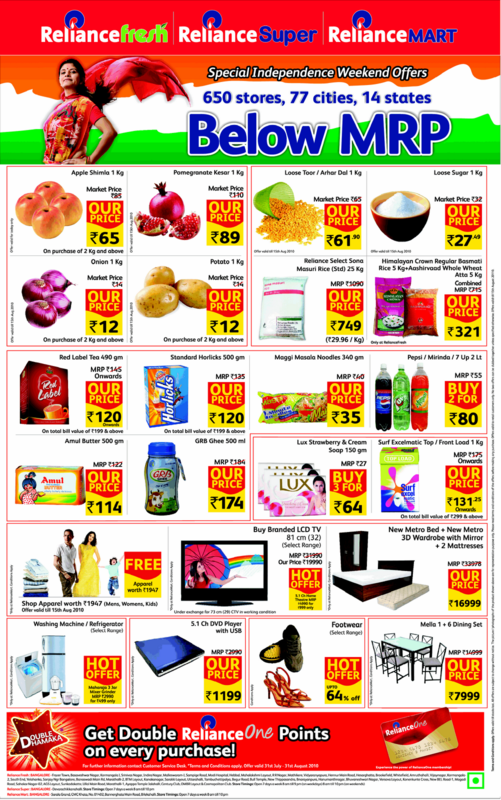 Sensing an opportunity, one of the first retailer in the country to take advantage was The Future Group. Way back in 2004, the company which operates the largest Hypermarket chain under the trade name “Big Bazaar” created a unique concept “Sabse Sasta Teen Din”, which translated into English means “the cheapest three days”. When they first experimented this concept on 26th January, India’s Republic Day which also happens to be a National Holiday, the queue outside the store located at Lower Parel in downtown Mumbai was miles long and the store had to be shut for a few hours to ensure safe exit of those who had already walked into the store! Ever since, there was no looking back. Founder & CEO Kishore Biyani who is known as the pioneer of Organized Modern Retail in India has experimented more and more – a mantra that he and his company lives by. The three days became longer and usually were tagged to the closest weekend and over a period of time, more such events were created. As always, many others in the business followed suit and started following their own trends – creating marketing concepts that suited their respective business models. 2010 was a bit special though. 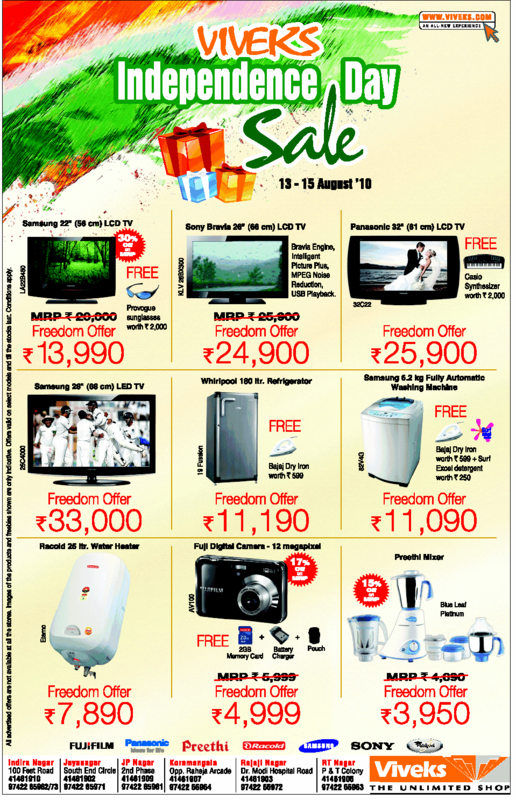 To celebrate the 63rd Independence Day on 15th Aug., almost all the large Retail players in India attempted such a concept in their own way. Newspapers were abuzz with articles, write-ups, advertorials and full-page advertisements. Needless to say, news publishing houses would have cashed in on this opportunity; after all, they have been quite starved over the past two years with minimal ads by Retailers who pulled back their spending after the global recession which impacted Indian consumers more psychologically than financially. The message from players across product categories ranging from apparel to electronics, grocery to home furnishing was loud and clear – discounts ranging from 10-60% over the weekend. The hype was carefully built-up over a period of time and the buzz in the minds of shoppers was clear – visit the stores at the earliest and get the best out of the season. 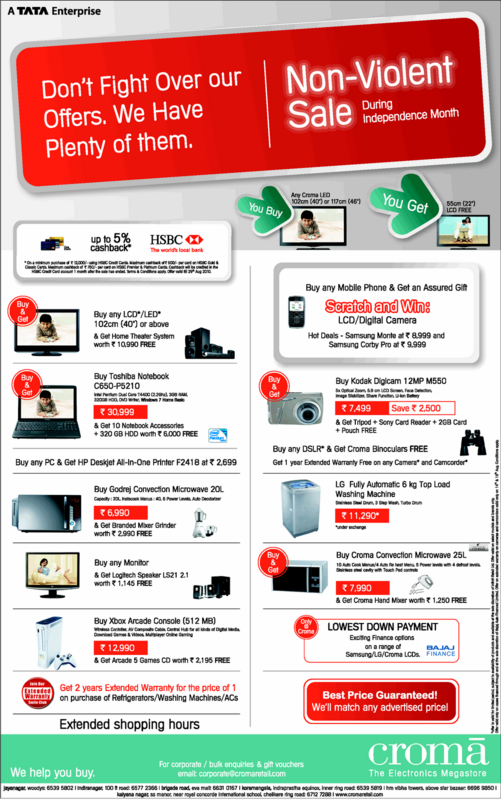 Erstwhile popular but now dormant retailers like Viveks, one of the oldest and trusted electronics dealers with a strong presence in South India bounced back with amazing offers. In fact, this was the very place where my parents purchased our first prized possession, a Crown Colour Tv in 1981 at a nondescript location called Luz Corner in Madras, (now known as Chennai). Over the weekend, my mother went there again, this time to buy a Microwave Oven, a reasonably new gadget in the life of Indian homemakers that promises comfortable yet delicious cooking. Well, she visited the store for just one reason – her trust in the brand “Viveks” continues to remain strong, where almost all our household items have been purchased for the past three decades. 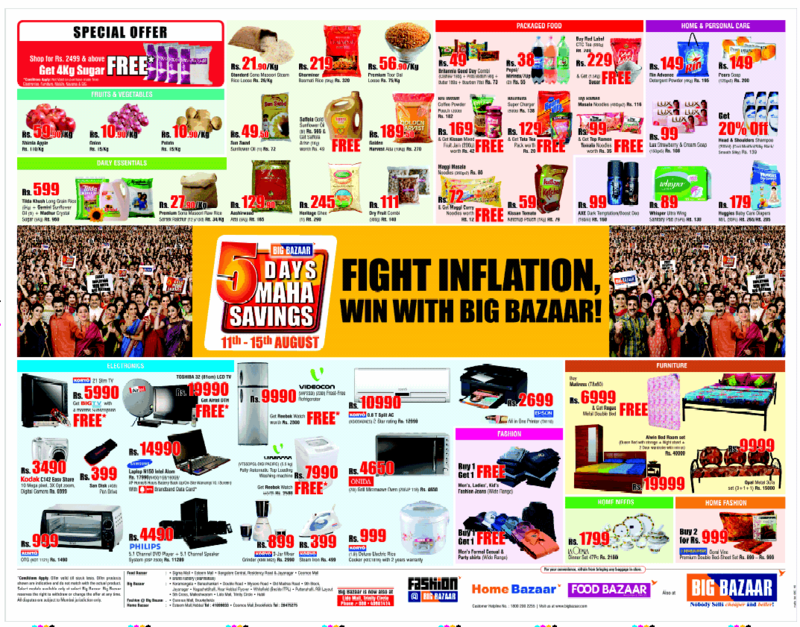 One of the most exciting concepts created this year was again from Big Bazaar, aptly titled “war on inflation” – helping housewives to fight the price rise in the economy. While everyone from the Prime Minister to my car driver have been talking about the rise in prices of essential commodities and the measures that must be taken to curb them, The Future Group was the first one to create an impact. 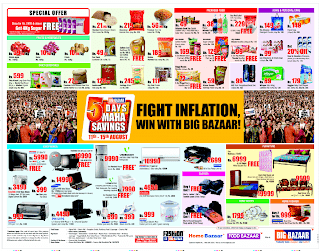 It has been running various campaigns in the media, highlighting the fact how Big Bazaar can together fight with the middle-class households by offering products at lower prices and shoppers can buy large quantities and store them for future usage – a form of hedging, if one could say so. Expectedly, all the stores in the country, numbering over 125 were over flowing with eager shoppers who started thronging the stores since as early as 9 in the morning until 10 in the night. Somehow, the focus of shopping during the season remained on categories such as Grocery & Household and Electronics & Appliances. E-Zone (another Future Group format) and Croma (from the house of Tatas), both of which operate in the premium consumer durables space and target SEC A & A+ went ballistic about their offering, by providing never before prices coupled with freebies. Most notably, both were offering spot loans from Bajaj Finance, wherein select products could be purchased on EMI – Equated Monthly Instalment after paying a token sum as down payment. The processing of loans was quite simple – in just a few minutes after obtaining some basic documents such as an address proof and an identity proof, loans are sanctioned on the spot if one holds a credit card. I was amazed at the speed at which loans ranging from Rs. 10,000 – Rs. 60,000 was being sanctioned, without any collaterals or scrutiny. It is anyone’s guess what happens if the loan is not paid back or the borrower vanishes once for all. 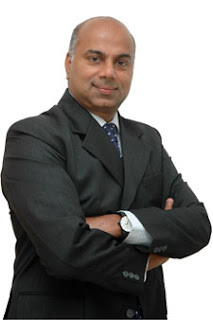 Reliance Retail which operates multiple formats kept its communication straight – highlighting the number of stores and thereby the inherent foothold it holds in the business. Some traditional local retailers tried their best to match up with their national peers. 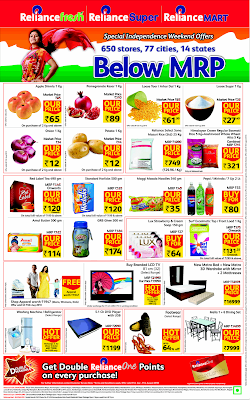 While they successfully demonstrated their presence in the business and their respective leadership positions among their target customers with full-page ads in national dailies, they also showed that they could offer at prices similar to those offered by national players thereby conforming their positioning – they remain equal if not cheaper compared the newer larger entrants within the business. One question that came to my mind over the weekend – why so much fuss to offer the best to customers! Do we need special days in a year to pass on the benefit of margins to shoppers? Is it just a trend that’s getting started or would we evolve as we move forward? Many in the Industry already agree that in India, we just can’t rely on Thanksgiving and Christmas Shopping like in the West, since we have more than 300 days of festivals all through the year across six major religions, a dozen national holidays and many more regional excuses for shopping. Isn’t it better to maintain a momentum and build shopping behaviour all through the year rather than just creating hype during a one-off period? Am sure, the answers could be mixed and diverse, just like our Retail environment. Well, that’s the best thing about us. Incredible India. Jai Hind.